Forever Florida is a 4,200 acre adventure park located on the Allen Broussard Conservancy in Central Florida. Their goal is to conserve as much of natural Florida as possible by providing thrill seekers with zip line adventures, working ranch experiences, and nature tours that take visitors through wild Florida ecosystems. The Black Tie Digital Brand DNA Architecture is a proprietary process we use to discover our client’s business. This process reveals a company’s purpose and its aspirations. The DNA is essential to craft a digital marketing strategy that will enable our clients to dream bigger and attain their goals. 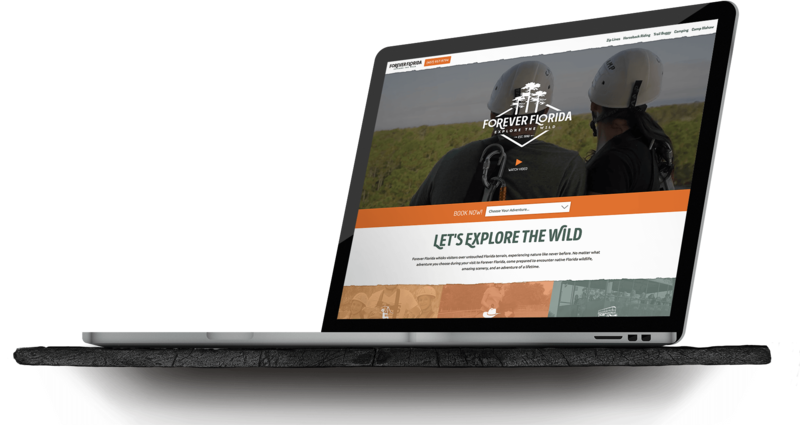 Forever Florida came to Black Tie Digital Marketing needing a complete brand revival and digital marketing strategy to compete with other adventure parks in the area. Their brand was outdated and it was hurting the image of the park. With visitors down year over year they hoped to revitalize their visitor base with an updated logo, website and comprehensive digital marketing strategy.  "The entire Black Tie team have done an amazing job rebranding and focusing all our advertising and marketing efforts. They have captured the essence of Real Florida to uniquely showcase who we are. Let's Explore the Wild - Forever Florida!" Forever Florida needed a radical redesign to attract new adventurers. Their old brand did not accurately represent the uniqueness of this adventure park. It was dull and dated. The new brand evokes the history of Florida, the wilds of the conservancy and has an air of mystery that beckons adventures to learn what thrills the park has to offer. But, most importantly, it looks really great on a t-shirt. The Forever Florida website was actively discouraging visitors from booking adventures. The outdated design and slow response time left a lot to be desired and reflected poorly on the park. Because we needed to instantly refresh this brand and begin generating business as soon as possible, we took a new approach. We believe in the power of branding so much that we did not want to be sending traffic to the old site. 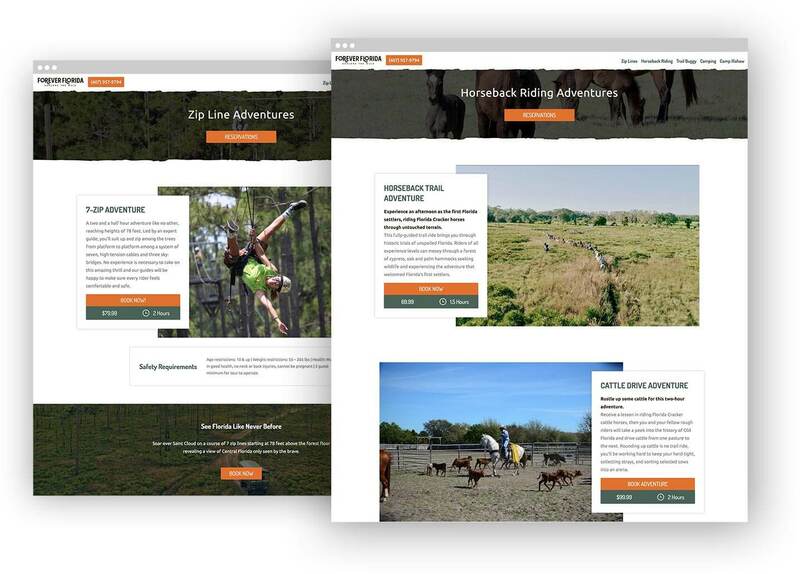 We built a microsite that was finessed by our developers to provide users only what they needed - a way to book adventures. This enabled us to design and build a beautiful custom site without stopping website operation. This also enabled us to create with a “Growth Driven Design” approach which relies on traffic data to dictate the design and flow of the site. 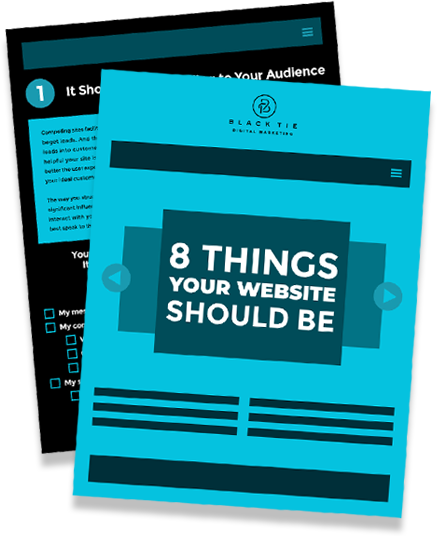 This resulted in a dialed-in user experience wrapped in a stunningly designed website. Designing and building websites for a spectacular mobile experience is essential. With mobile visits surpassing desktop traffic every year, we believe building a website for mobile first is the right way to create an intuitive cross-device experience. 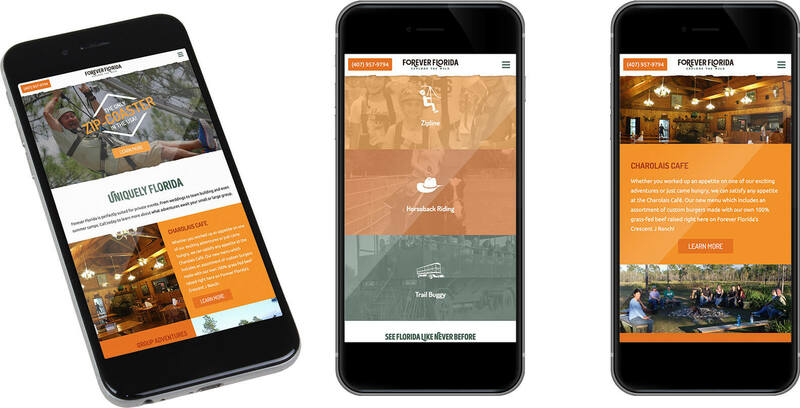 After we designed and developed Forever Florida’s website with the perfect mobile experience, we built onto it to ensure that the site will function flawlessly on desktops and other screens. 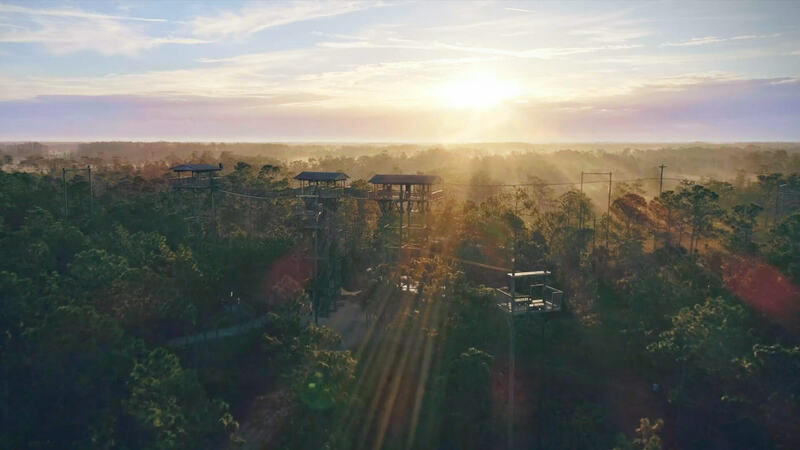 With a location as pristine and beautiful as the Allen Broussard Conservancy and adventures as thrilling as the Rattlesnake Zipcoaster, Forever Florida needed to show visitors what they’ll encounter. A video shoot was in order. Our video crew spent days capturing epic vistas, zipline adventures, wildlife and the workings of the Crescent J Ranch. The finished products not only added value to the website, but also became decisive pieces of content that were used complete an effective and comprehensive digital marketing strategy that includes social media and video advertisements. This video is such an effective marketing tool that it has over 40,000 views and has been shared more than 350 times on Facebook alone. Forever Florida needed more than just a digital marketing strategy to revive its customer base. 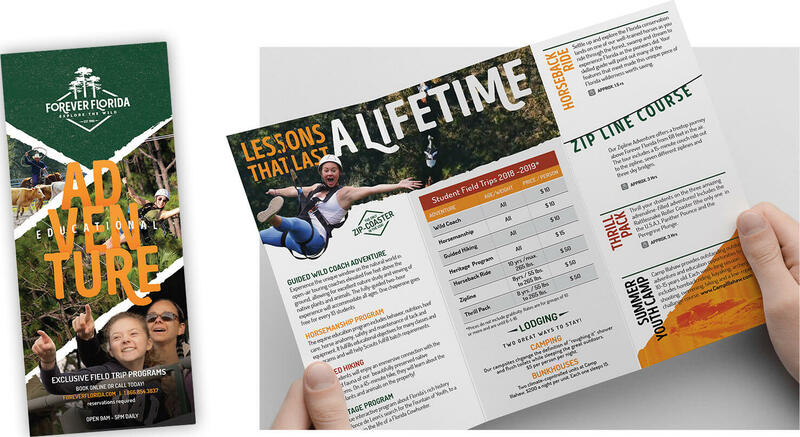 Print materials are very important in the adventure park industry. 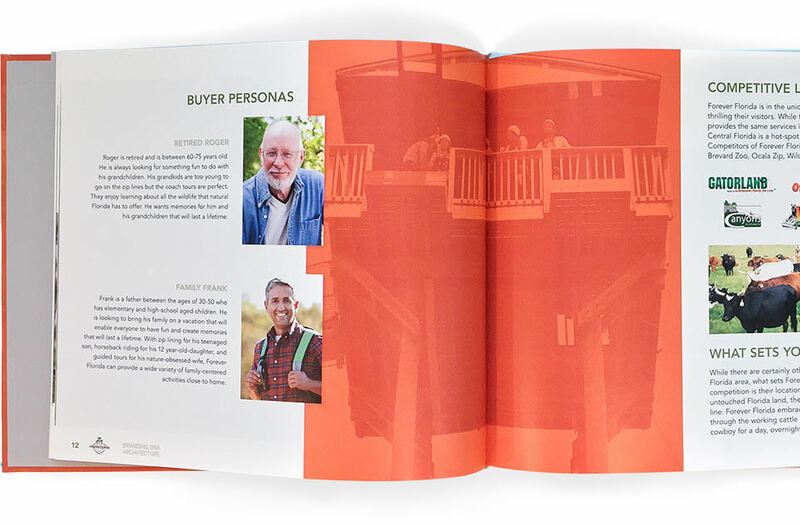 Pamphlets and brochures to hand out at events and to place in visitor centers are just as effective as paid search campaigns. 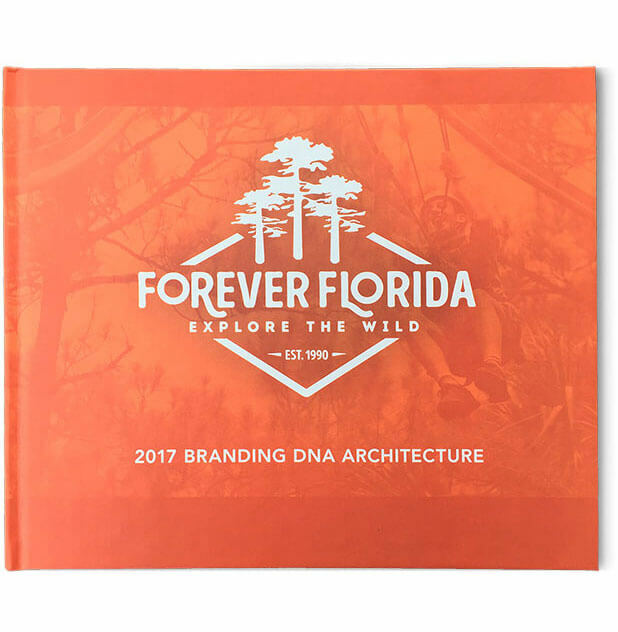 In addition to a stunning website and digital graphics our design team has created countless print items that enable Forever Florida to reach as many adventurers as possible.